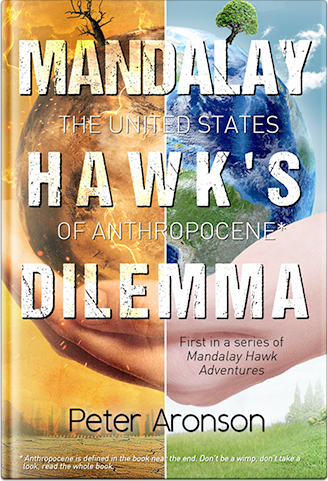 First in a trilogy about Mandalay Hawk and her friends, three crazy teens with no clue and no chance tackling monumental world problems. Teenager MANDALAY HAWK is a cross between a race car driver gassing it at 150 mph and a young Martin Luther King Jr. striving to overcome. The world in 2030 is broiling, 90s the norm. Global warming is causing havoc. Mandalay and her pals have no choice: Adults screwed it up. Kids (KRAAP: Kids Revolt Against Adult Power) have to fix the problem. Mandalay, Gute and Jazmin battle a principal who wants to expel them, a government that wants to crush them and parents who just don’t believe they can do it. Yo, yo, yo Mr. President William “Bucky” Billingham, be a man with a plan, not a tiny shrimp who’s a wimp. Our Democracy made you electable, our people made you selectable. Make sure we are sustainable – so you’re known as the Prez who’s Cool. make sure Mr. President, that you can’t be bought. KRAAP – Kids Revolt Against Adult Power. When the world needs saving, what else is there to do? This book is done, in the final editing process. It will be available soon... read the first chapter below... Thank you. It was May 8, 2030, the middle of the night, 2:00 a.m. to be exact. Mandalay Hawk’s soft beeping alarm jolted her awake. She jumped out of bed, brushed her teeth, dressed in t-shirt and shorts, grabbed her heavy backpack and tiptoed shoeless and silent down the stairs. She slipped on her Converse high tops, stretched a black cap over her hair, positioned a headlamp over the cap and set off into the night. Mandalay, 14 years old, was on a mission. She had chosen the path to school through the edge of town, crossing Main Street only once, then into the woods to avoid detection. It was a typically warm and sticky spring night, about 70 degrees, and Mandalay was already sweating. She flicked on the headlamp as she approached Nagatoon Regional High School through a dark, wooded path with tall trees and crunchy leaves, a path more accustomed to bears on the prowl than ninth graders trading in mischief. The light shined a full 50 feet ahead. Mandalay didn’t want any surprises, furry or otherwise. Mandalay walked to the back of the school and found Principal Bushwick’s office window. She removed her backpack and pulled out a large screwdriver and rubber gloves. She put the gloves on. She pried open the window with the screwdriver, hoisted herself onto the ledge, and climbed inside. With the headlamp, Mandalay could see Bushwick’s large desk on one side of the room, on the other side, against the wall, she saw what she was looking for: A large, metal, gray supply cabinet sealed with a metal lock. She unzipped her backpack and removed a sledge hammer. She placed the end of the screwdriver on the lock base, paused, took a breath, and then smashed the sledgehammer down on the screwdriver. The sound echoed as the cabinet shook and tilted forward, but the lock did not break. “Jeez,” Mandalay said out loud to no one, dropping the sledgehammer and shaking her hand in pain. She took a breath and thought. She pulled a wooden chair towards the cabinet and climbed on top. She leaned towards the cabinet, jumped forward and swung with one arm, using her flying weight to propel the sledge hammer down onto the screwdriver. The smash and Mandalay’s crash against the cabinet shattered the nighttime silence. The lock fell open and dangled. Mandalay looked at the clock on the wall. 2:35. She had less than three hours. With gloved hands, Mandalay opened the cabinet and found what she was looking for: 25 boxes of No. 2 pencils. She placed the boxes neatly on the floor and sat down cross legged. She removed a jackknife from her backpack, opened the first box of pencils, laid the 20 pencils on a thick piece of cardboard she had brought with her to use as cutting pad, and proceeded, one by one, to slice off the erasers from every pencil. She then opened the second box and did the same thing. Within a half hour, Mandalay had a small pile of erasers on the floor and three boxes filled with eraser-less pencils. Box after box, pencil after pencil, she cut off erasers. She didn’t really care about what would happen if she got caught. She was in Nagatoon Regional High, in the small town of Nagatoon, Maine, all by herself, in the middle of the night, doing something she thought was a really good deed, but knew, not-so-deep down inside, that she would get totally screwed if caught – yet, she was not scared a lick. She had to saw off erasers on 500 pencils and be out of the school by 5:30 am. By 4:30 she had completed 16 boxes. By 5:00, her hand cramping, she had six boxes left. She had to speed up. She held five pencils on the cardboard with one hand and sliced across the five erasers with one, steady cut. Then 10 pencils at a time, slowly, carefully, slicing… until she was done. 5:22. She re-stacked the 25 boxes of pencils in the cabinet, shut it and removed from her backpack a lock identical to the one she smashed open. She locked the cabinet and left the key in the lock, hoping no one would realize something was up until it was too late. Chapter 2: Tom Hawk: Usually the Greatest Dad Ever!